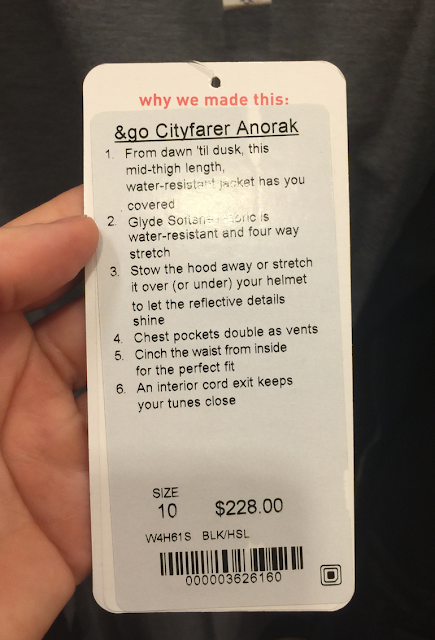 It is really annoying that the &Go Cityfarer Anorak is priced as absurdly as it is because I really liked it a lot. For a long time I was obsessed with getting the similar Urbanite Blazer off the resale market and I finally managed to get one at a decent price but it looks terrible on me. 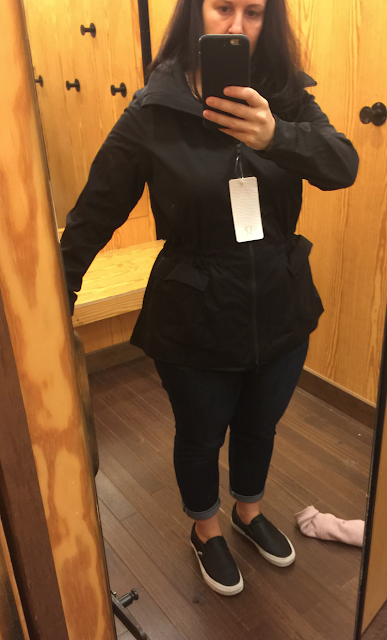 This jacket has similar styling but is way more wearable for my body type. I think it should have been priced at $168, maybe even $178. I grabbed my TTS 10 to try on and I sort of wish I’d also grabbed a size 8 just to see. It’s a very roomy TTS but I think you need that roominess for the right drape and fit and for layering. The size down would have probably looked nice too but then layering would have been tricky and you wouldn’t get that dramatic peplum/cinched in waist look. 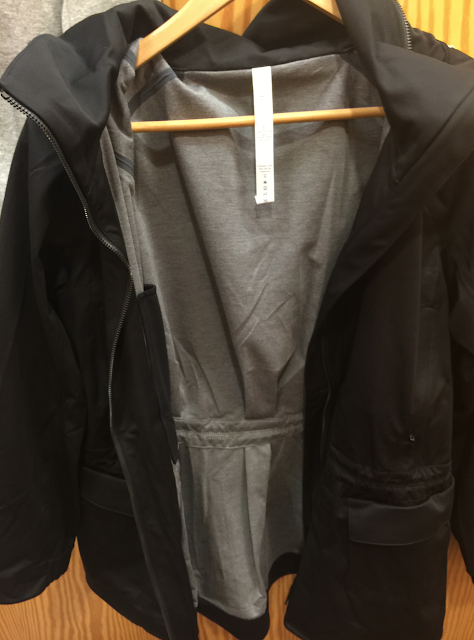 This jacket is water resistant, not water proof, and it is lined in nice soft coolmax. It’s not at all a substantial jacket but it is also not flimsy. I’m surprised that this jacket is being released in winter because it is really more of a spring weight jacket in weight and in styling. The outer Glyde isn’t the same glyde used in the Down For A Run line. This glyde is a soft-shell so thicker and it has a matte sheen to it that makes it a bit ‘fancy’. I think I’ve seen this material used in the mens line before but never the woman’s line. 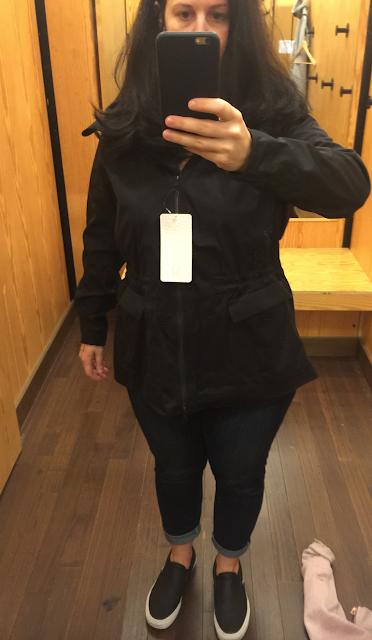 All in all, I really liked this jacket a lot but I hate the pricing on it. I’m going to keep it on my radar and really hope it gets marked down for Boxing Day or Black Friday. I think what I liked so much about it is that it reminded me a lot of the Barbour Jacket I tried on at J Crew last year, fell in love with but left behind due to price. you can cinch the waist on the inside. Here it is mostly uncinched which gives it a bit of a boxier fit. "Heathered (Black) Sapphire Blue Swiftly Tech LS"
I like your jeans! What brand are they? Thanks! They are Paige Premium Denim crops that I got at Nordstrom Rack for $60. I like them but they are not super versatile because they are crops and have to have the cuff folded. Great with sneakers in the spring or early fall, in the winter not so great. It looks really cute on you. Perhaps worth the splurge!! Thanks!! Enabler!! lol!. I'll have to see if I can sell a few items to make it a guilt free splurge. It looks AMAZING on you. I agree with 6:08. It may be worth the splurge. In fact, it looks so good on you, I am now considering it despite the crazy price. Thanks!! I am so strongly considering it but I hesitate because I think the price will mean it is likely to be marked down. I don't want to overpay for it. It looks sooooooogoof on you!!! That silhouette and the higher waist looks GREAT on you! You made this jacket look really good. It looks horrible on the model on the LLL website. You look fantastic in this jacket. And the jacket looks great on you. Perfect match. It does look very good on you, no question! It's a tough time of year to justify a splurge on yourself I know but agree with others, if u really love it, go for it. U have the holiday period to change your mind…that's if u can resist wearing it right a way!! I just got my upload order and I can't remember the last time I was excited to get my order. Really happy w my items (ugh for bank account). Got both color CRBs and while they are a little scratchy, the colors are bright and gorgeous. Happy I ordered the kayak too almost didn't. 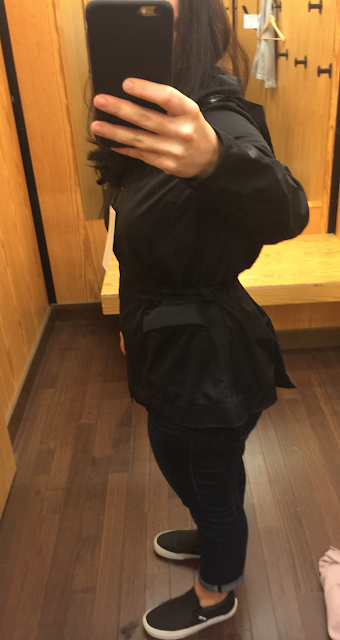 Love the black grape TTT….they are really pretty and flattering fit. LS sapphire swiftly will end up being one of my favs and the face the frost half zip in tender violet has nice details and seems cozy and a surprisingly roomy TTS..with room to layer. Does anyone have the beat the sleet pants? I just got mine and they are so thin…it is hard to justify $118 for them. I noticed they are almost all sold out on the US side today. I was hoping to find the reviews of last years but can't find any. Does anyone have them that can comment on their use? Thanks ladies and as always…thank you lulumum…I can only imagine how much time you put into all this. I just picked up a pair yesterday. I found they fit really well, are opaque, and super slimming! I agree, $89 is a lot, but I think I'll get a lot of use out of them. I love you and your blog -but using the word "tragic" for an overprice anorak in the wake of the recent events in Paris and elsewhere, really???? 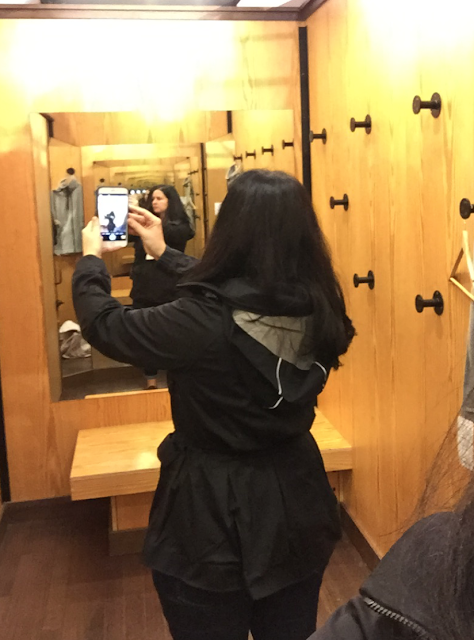 Great review.So do you think that it would be too light for the winter?It looks great on you , i like that it has a medium length. Yeah I like it too. I didn't realize the &ego line was for cycling but annoying that it's not waterproof. I might get it on wmtm if it's marked down nicely but not 10-20 off. They have a bunch of cute items coming up. You are right. I am sorry. When I'm home this afternoon I will edit that. Just wanted to thank you for the blog. I am a nerdy academic and I love taking breaks from my work with Lulumum! 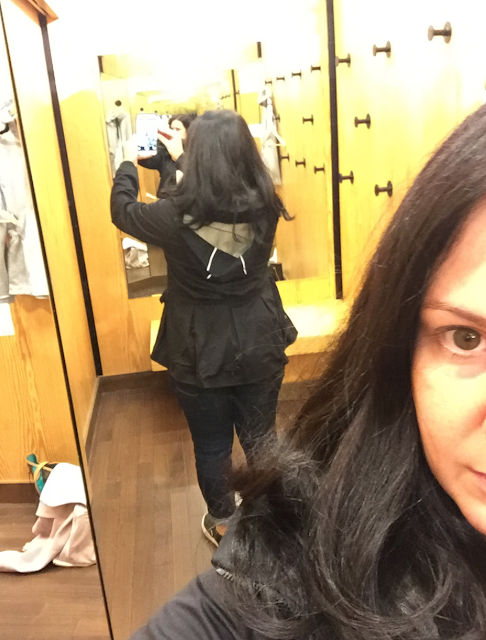 Lulumum have you tried the &go destination jacket? 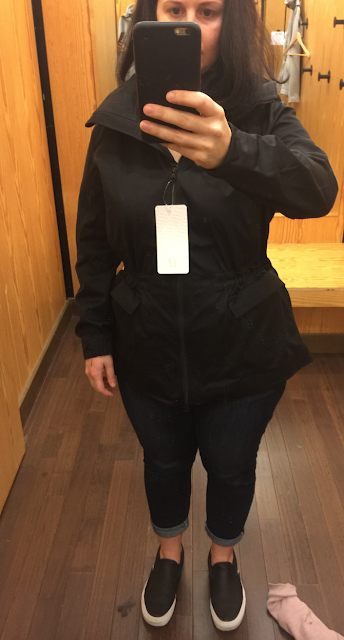 It looks to be a similar fit to this one, is waterproof and is $178. I am super curious to see how the destination jacket compares to the anorak. This jacket is very flattering on you and shows off your small waist. It didn't look good on the site but it really works on you.